Everyone seems to be trying to guess who the next actor to play the lead role in Doctor Who will be once Matt Smith regenerates in the 2013 Christmas Special. Rather than settle on a specific name, I want to stick my neck out and come up with a few traits that I suspect the new TARDIS resident will have. A limited TV profile. The actor may have one or two fairly recent, moderately prominent TV roles under his belt, just as Tennant had Blackpool and Casanova, and Matt Smith had Party Animals. But he won’t be one of the actors that you see everywhere. TV budgets, and the need to sign your life away for the best part of five years, dictate that the role will be taken by an actor who is not yet well-known or powerful enough to command a crippling fee. A substantial theatre acting CV. Both Tennant and Smith had extensive acting credits prior to taking on the mantle of the Doctor – predominantly on stage rather than on screen. Expect the new Doctor to have one or two long West End runs under their belt, maybe some RSC or National Theatre work. Expect also that certain tabloid newspapers and TV magazines will brand them an “unknown”, as if nobody knows who actors are unless they’ve been in EastEnders or Coronation Street. An older actor. Steven Moffat was originally looking to cast the Doctor as older when looking for Tennant’s replacement, but Smith convinced him otherwise. In fact, Smith’s onscreen portrayal often feels much older than the actor himself. I’d be surprised if another actor of similar age could pull that off – so expect the lead actor’s age to head upwards again. Male. There are some fantastic actresses out there, many of whom could more than cope with playing one of the most iconic characters on television. And I would love to see a Saturday tea time drama that revolved around a strong, charismatic female lead. I have to be realistic, though, and suggest that the twelfth actor to play this role will be as male as his predecessors. I have a list in my head of people who I think would be good for the role. Most of them only fit three out of the four points above. But that’s why I’m not a casting director. As we rapidly approach the end of this series, I’ve created an index page for all my Ten Things About… posts. And here are this week’s rambling musings about Neil Gaiman’s episode – which, far from being a nightmare, felt more like a bad dream brought on by a surfeit of cheese. …if the back doors of the cabinet were open at the same time one could see through the machine. The other side of the cabinet did not house machinery; instead it contained a red cushion and some removable parts, as well as brass structures. This area was also designed to provide a clear line of vision through the machine. Writing a review for Merrily We Roll Along in reverse (to match the narrative technique of the musical) earlier today was fun, even if I don’t think it really came off as well as it did in my head on the way home last night. It was fun to try, though. Every so often, it’s useful to impose a strange limit on yourself as a way of shaking up how you write. Originally published on The Stage’s website, it’s reproduced here in full. As with last week’s Asylum of the Daleks, rather than doing a straightforward review I’m listing ten points of note about this week’s Doctor Who episode, Dinosaurs on a Spaceship. One of the reasons the eleventh Doctor is so unpredictable is that, even in the scenes where you know what he’s going to say, Matt Smith often chooses a line reading that throws a conventional line – like the oft-heard “Run!”, such at the end of this episode’s pre-credits sequence – into new areas. Part question, part panic, part “off you go, while I stay here and find out what’s going on, even though I almost certainly know whatever it is could well kill me”, Smith’s delivery is one that needs not so much an interrobang at the end of it, as a whole panoply of punctuation marks. At first glance, Riddell doesn’t seem like the sort of man the Doctor would hang out with – dalliances with dancers and liquorice notwithstanding. The sort of man who lives on the plains of Africa killing wild animals, though – why would the Doctor befriend him? The best answer is that he is another of the Doctor’s little projects, and is not necessarily a cold-blooded killer (any more). During the episode, his initial instinct to kill the encroaching dinosaurs comes from a sense of self-defence, and when fending off the raptors at the control room he goes for stun guns rather than applying lethal force. I’d say that, while Riddell might present himself as a big game hunter, if anything it’s a bit of a front: he’s more likely to end up in Alan Quatermain-style scrapes, occasionally with a bow tie-clad lunatic at his side. Of all the companions that David Tennant’s Doctor had during his spell in the TARDIS, it was Donna Noble that suited him the best. Pitting Catherine Tate against Tennant’s fast-talking wide boy was a match of competing, but equal, egos. When a double act works as well as Tennant’s and Tate’s did, it’s easy to reach for the Hepburn-Tracy comparison – but it feels appropriate with this pair of actors, who fizzle and spark off each other so well that it’s hard to believe that The Runaway Bride was the first time they had worked together. 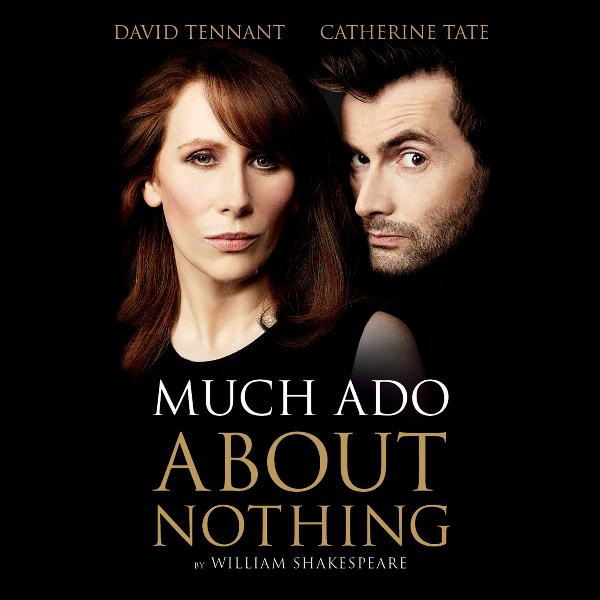 So it’s good to see that now Tennant has long since turned over his TARDIS key to the new guy, the pair have found an opportunity to work together again, in Josie Rourke’s exuberant version of Shakespeare’s screwball comedy. Casting Tennant as Benedick and Tate as Beatrice feels a safe decision – not in the sense of not casting dangerously, but in that one knows that the pair will be able to portray the ups and downs of the prototypical odd couple extremely effectively. That said, I honestly hadn’t expected Much Ado About Nothing to be so funny. Many renditions of Shakespeare’s comedies induce little more than polite laughter, but this production regularly induces real bellyaches.